Another month has flown by - honestly where is the time going?! 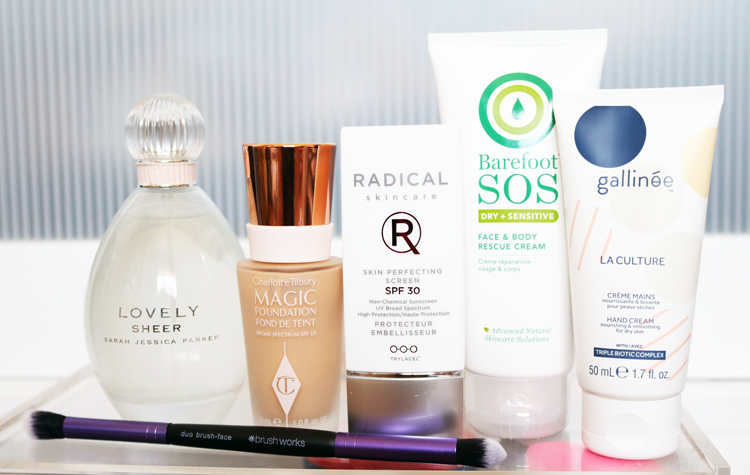 These are my May Favourites and I'm happy to say that most of them are brand new discoveries. It's very rare for me to feature a new perfume in my monthly favourites as I have a tendency to stick to old favourites and not really try out so many new ones. That said, I had one spritz of this on my wrists and I was in love. I wasn't much of a fan of SJP's original Lovely fragrance, but this new one is much more my thing. Lovely Sheer is a lot lighter and more 'fresh' than the original, but still very feminine so it's perfect for wearing during warmer weather. Top notes of Moroccan Orange Flower Absolute, Mandarin and Bergamot Sicily makes me think of summer holidays on the beach, and I love the vintage inspired bottle. If you read my review of this foundation earlier in the month (link above), you'll know that I sung the praises of this because it's full coverage and truly covers everything you want to have covered without feeling heavy or looking cakey. 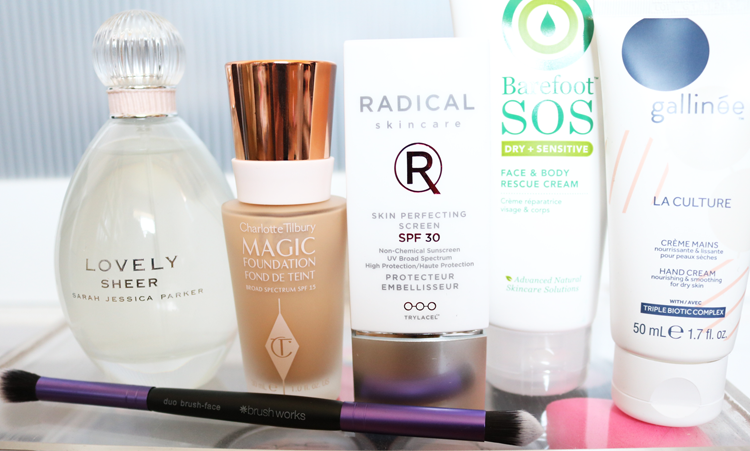 Great for days or evenings where you want to cheat your way to a good skin day! I was introduced to Brushworks by InVogue recently, and I've been using their Face Duo Brush almost everyday since I got it. Dual ended brushes come in so handy for holidays and travelling with, and this one has a denser, slightly pointed end for blending in concealer and an angled, fluffier end for sweeping on eyeshadow or setting concealer under the eyes with translucent powder. Really soft, great quality, cruelty-free synthetic bristles, and their brushes are slightly cheaper than Real Techniques. The more I immerse myself into the world of skincare, the more interested I am in SPFs, and I've been slathering on this one from Radical Skincare like there's no tomorrow! It's 100% non-chemical so it doesn't block my pores or cause me to have any breakouts; it's broad-spectrum so protects against UVA and UVB rays, and it's super light in texture and doesn't feel greasy or sticky. If that wasn't good enough, it's also mattifying and helps to keep shine at bay throughout the day which my oily/combination skin type really appreciates. Seriously good stuff. I noticed that Barefoot SOS won the Best Eczema Award in the 2016 Natural Health International Beauty Awards again (I think they've won it about four times now! ), which got me rediscovering this little gem as I've used it on and off for years. I like to have a tube on standby in case of an eczema flare-up as it's fantastic for soothing inflammation and relieving that dry, itchy feeling straight away. I'm currently using their Shampoo & Conditioner which are brilliant as well. My hands have been quite dry lately so I've been reaching for more nourishing and hydrating hand creams to give them some extra TLC. I've really been enjoying using this one from Gallinée because it's lightweight so I can use it throughout the day, but it's also very moisturising. I love the idea that the friendly bacteria in this are helping and supporting the health of my skin too, so I'm hoping this will improve the texture of my hands over time to make them smoother. What are your current beauty favourites? I used a sample of the magic foundation at the weekend and was really impressed, have enough for one more application so I will be testing it out big time before buying! I want to try that Charlotte Tilbury Foundation! It looks so good and everyone has been raving about it. Just went back to your original review and the swatches look great. Thanks for checking it out Kim - try and get yourself a sample of it from one of their counters if you can!